…When soft gurgles slowly get replaced with commands! It is time for you to realize that your bundle of joy is growing up. and that it is high time he moves away from the confines of home to a preschool! Jack and Jill Pre-School – Bhavans situated at Mangaf is a sister concern of IES – Bharatiya Vidya Bhavan, Kuwait. A school for tiny tots with a difference to impart value based, child centred education was a long cherished dream of our revered chairman – Mr. N. K. Ramachadran Menon, a visionary in the field of education in the State of Kuwait. The dream attained fruition in the month of September 2008. This shrine of education had a humble beginning. The school began to function with a modest 57+ students, flourished and carved a niche for itself in the colossal field of education in the Middle East. It is indeed a well-established fact that the competence of a pre-school curriculum has a significant impact during the child’s formative years. 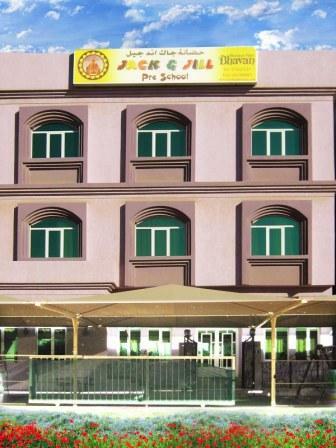 Children at Jack and Jill are entrusted with highly experienced dedicated teachers who have been trained to cater to the needs of kids in the multi-ethnic cosmopolitan horizons of Kuwait. At Jack and Jill, we help the children to fine-tune their innate skills. Children are gently ushered to the unknown realms of knowledge in a very systematic manner. Every child is precious at Jack and Jill. Enterprising educators endowed with enthusiasm help the children to explore the world of alphabet and numerals in a pleasant atmosphere incorporating the most modern technology blended with well-acclaimed pedagogic methodology designed for the overall development of peppy tots. We pride ourselves on the fact that within a short span of time, our school has grown to a strength of more than 200 children, which itself is a benchmark of its social commitment and pedagogic assurance. Our Kindergarten curriculum is indeed remarkable. The pedagogues at Jack and Jill ensure that a child is provided with a vast range of planned and professionally chosen, fun-filled activities, that make him/ her learning through a constant process of self-exploration. We revolutionize learning by making it interesting, engaging and motivating. Besides all these learning activities, we help the children learn basic etiquette like exchanging greetings, sharing of food and toys, identifying their possessions etc. One big advantage is that as children interact with children of their own age, they tend to develop their language skills at a fast pace with more vocabularies to their credit. We carefully and methodically prepare children for the bigger school, instilling self-confidence and independence in them. So, if you wish to send your gift of God to a preschool where the correct student-teacher ratio is maintained and where your children are treated with utmost care and affection, then you will choose only Jack and Jill. It is because “well begun is half done” and you just cannot compromise on the future of your beloved child. They deserve the best and it is our vision and mission to provide the best for your most valued possession.